There were days, approximately a dozen years ago, when I was pretty enamored with Finnish metal, in just about all of its varieties, from bestial to melodic black to gothic to melodic death to Nightwish. At that time, trying to introduce this music to the masses, and knowing a few Finnish hockey players on our local university team, I have made a couple of samplers, titled Pro Patria Finlandia, taking a cue from Impaled Nazarene. There was just something in the Finnish way of expressing their emotions, in their sensibility, perennial sadness and feel of melody that attracted me. Those times have inevitably passed, but I remember that those Pro Patria Finlandia samplers had a song or two from Eternal Tears of Sorrow on them. Never a frontrunner in my book, nevertheless, I have enjoyed Vilda Mannu, Chaotic Beauty and A Virgin and A Whore – all early albums by the band. Tempered thrash at the beginning of their career, Eternal Tears of Sorrow came up with a great moniker, and towards the late 90s began adding a modicum of gothic romanticism to their melodic death. As a result, keyboards with time became prominent and the sound became cleaner. For whatever reason the gap between A Virgin and A Whore and subsequent Before the Bleeding Sun was very long, and by then I have definitively moved on in my music endeavors. Before the Bleeding Sun made little impression on me in one or two spins I afforded it, so Eternal Tears of Sorrow dropped off my radar until Saivon Lapsi hit my promo deck just now, thus, in a way, this album is a new unbiased re-introduction to the band, with my tastes having undergone severe transformation. So many years have passed, and I am obligated to report Eternal Tears of Sorrow style has not changed radically. Songs like Dark Alliance and Legion of Beast still have familiar bite in their guitars, double bass punch in drums and Altti Vetelainen’s raspy growl has matured. What is pretty obvious in spots is the band must have listened to Wintersun a tad and has become enamored with a wall of sound orchestral symphonic background to add to their version of melodic death. To me, when Eternal Tears of Sorrow ratchet that sound volume down, they come off more authentic (Legion of Beast). 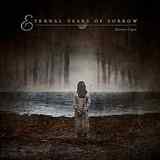 It is expected of Janne Tolsa (formerly of Tarot) to contribute direct strong keyboard melodies, but the orchestral effect did not entirely work for me. When the band treads closer to the more power/gothic feel in their music, songs like Dance of December and Swan Saivo emerge, representing the best Saivon Lapsi can offer. With its narrative galloping chops and distinctive melody Dance of December is the closest the band sounds to their former A Virgin and A Whore-era selves. Clean vocals are no longer temporary episodes in Eternal Tears of Sorrow repertoire. Jarmo Kylmanen is a permanent bandmember now, but I can’t say his clean vocals are entirely convincing to me. He makes The Day sound poppy and Eurovision, trying to lift that song’s chorus, and his duet on Sound of Silence with a female vocalist is wishy-washy at best. That ballad is a somewhat questionable trip to a magic dreamland, and, if anything, the closer Angelheart, Ravenheart (Act III) proves that the band is better off traveling to darker places. On that song the enchanted ah-wah wall of sound eventually runs into cleaner chorus with more individualized lines and more pronounced string instrument sounding arrangements, as well as uplifting keyboards. In the end, Saivon Lapsi did not make me regret I have missed all those years without Eternal Tears of Sorrow on constant rotation in my player. Yet, with an exception of a few more non-descript songs towards the end (Beneath the Frozen Leaves, Blood Stained Sea), the album represents an even collection of quality material, which could be especially worth for you if you weren’t skipping on all the albums in between A Virgin and A Whore and now.